Last May the elite climbing community told Erik Weihenmayer he didn't belong on Everest. In this exclusive preview of the new afterword to Weihenmayer's book, Touch the Top of the World, the blind mountaineer fires back. A few days after I arrived in the Khumbu Valley for the Mount Everest climb, a rumor began circulating. Because I wasn't flopping on my face every few minutes, the Sherpas thought I was lying about my blindness. Women would approach me in the alleys of Namche Bazaar and wave their hands in front of my face. I'd feel the wind and flinch, which only confirmed their suspicions. Finally I resorted to drastic measures. I asked Kami Tenzing, our climbing sirdar, into the kitchen tent. "Kami," I said, "I want to give you a message to take back to the Sherpas." I pulled down my left lower eyelid, leaned my head forward, and my prosthetic eye plopped into my palm. "I can take the other out if you want," I said. "No!" he said firmly. "Not necessary." The greatest doubt about my pursuit of Everest didn't come from the Sherpa community; it came from Himalayan veterans in the United States. Climber and author Jon Krakauer wrote me a sincere letter attempting to talk me out of my plans. "I am not at all enthusiastic about your trip to Everest next spring," he wrote. "It's not that I doubt you have what it takes to reach the summit. . . . It's just that I don't think you can get to the top of that particular hill without subjecting yourself to horrendous risk, the same horrendous risk all Everest climbers face, and then some." Krakauer's letter gave me pause, and though I knew his attitude had been badly tainted by the 1996 Everest disaster, I respected his honest attempt to dissuade me. Nonetheless, I held on to the view that I would subject myself to less risk than other Everest climbers. I wasn't going as a guided client, not knowing the people I'd be sharing a tent with. I had surrounded myself with a good team of friends with whom I had climbed extensively--no paid guides, no superstars, just a bunch of buddies with a shared goal to reach the top and to be a self‑contained unit responsible to one another along the way. It was a quote from mountaineer Ed Viesturs, however, in a magazine profile of me last spring that floored me. "More power to him, and I support his going," Viesturs said. "But I wouldn't want to take him up there myself. Because he can't see, he can't assess the weather. . . . When I guide, I like people to become self‑sufficient. With Erik, they'll have to be helping him, watching out for him every step of the way." It was tough going forward in the face of experts who thought I would be a liability, risking my own life and those of my teammates. I had only shaken Viesturs's hand once, so I couldn't figure out how he presumed to know so much about my strengths and ability to contribute to a team. He hadn't seen the sixteen years I'd been climbing, learning rope management, crevasse rescue, and avalanche safety; he surely hadn't seen the days spent on big walls when my teammates hung from anchors placed by the blind guy. Or the years I spent becoming independent, learning to build snow walls, cook meals on gas stoves, and set up tents in whiteouts. Viesturs hadn't seen any part of my life except that I was blind. Truth be told, I had heard all the criticism before. When I rock climbed for the first time at age sixteen at a recreational program in New Hampshire designed to build confidence in blind teens, people had been supportive. "Good for you," they said repeatedly, when there was a big fat top rope to dangle from. But when I talked about learning to lead, most said I'd need to be able to see to place protection. So I learned to lead anyway, with help from friends. When I wanted to climb ice, most had warned, "It isn't stable like rock. You need eyes to know where to swing your tools and to know whether it's a good stick." So I learned to climb ice anyway, by feeling the face through the tips of my tools and assessing my placement by the sound of my axe striking the ice. The pattern continued, with expert after expert telling me I would never be able to surmount each progressive challenge. I pushed on, even though I often staggered beneath their pessimism, feeling like I was being buried under a mountain of "you can't." Were they right this time? I decided to go to Everest to see for myself. At the start of the climb, after crossing the Khumbu Icefall, a chaotic pile of ice, constantly avalanching and splintering, I understood why the experts believed a blind person had little chance. Kicked‑out boot marks wove a path through the jumble, often leaping over gaping crevasses. I crossed the icefall ten times with a teammate moving in front of me, ringing a bell from the loop of his trekking pole. My first trip took thirteen hours of intense focus and communication, but with each subsequent trip I cut my time, first to eight hours, then to seven, and finally to five, an average time for an Everest climber. Above the icefall the terrain turned to steep snow and ice faces intermingled with short rock steps. I finally established a rhythm in my pace and in my breathing and grew stronger each day. Where I was stepping had become less important than maintaining good internal balance. By summit day, oxygen deprivation, the steep face, and a 9:00 p.m. departure time had reduced all of us to an arduous crawl. The mountain had become harder for my team but had actually gotten slightly easier for me-‑I was used to the darkness. The best response to the naysayers came on May 25, when I, along with ten western teammates and eight Sherpas, stood on the summit of Everest. Ironically, my summit experience wasn't compromised by hordes of climbers clogging fixed lines. Most of the expeditions were leery of sharing a summit day with me, afraid I'd involve them in an "epic." 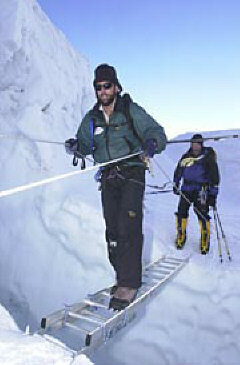 So we had left from the South Col with only one other team behind us and with our full focus on the mountain. Although making the summit was a great honor, far and away the greatest honor of my life was the decision made by my trusted friends, who told the doomsday experts to buzz off and linked their lives to mine. Still, despite our success, plenty of detractors continue to voice their opinions in Internet chat rooms and letters to magazines: "Now that a blind guy's climbed it, everyone's going to think it's easy. People will probably get hurt." "Why are people thinking this is such a big deal? Anyone can be short‑roped to the top by nineteen seeing‑eye guides." "Don't let 'em get to you," Chris Morris, a teammate, said after I shared their comments with him. "You climbed every inch of that mountain and then some." I knew he was right. There are some who will never be convinced, others who have no idea what to think, but many others for whom the climb forced a higher expectation of their own possibilities. Mountains are the most powerful places on earth, demanding the utmost respect from humans. But we enter far more dangerous territory when a few chosen experts decide who belongs on them and who doesn't. Perhaps this is a decision best left for the mountain gods. James Johnson, age fifty, has decided to set up a deferred charitable gift annuity. He transfers $10,000 to the NFB. In return, when he reaches sixty-five, the NFB will pay James a lifetime annuity of $1,710 per year, of which $179 is tax free. In addition, James can claim a charitable tax deduction of $6,387 of the $10,000 gift in the year the donation is made. For more information about deferred gift annuities, contact the National Federation of the Blind, Special Gifts, 1800 Johnson Street, Baltimore, Maryland 21230-4998, phone (410) 659-9314, fax (410) 685-5653.